My husband and I love going out to eat. Whenever we go somewhere that serves chicken parmesan, one of us always ends up ordering it! We’ve been trying to eat healthier so we thought making our own chicken parmesan at home might be a better option! These Chicken Parmesan Meatballs are a fun twist on traditional chicken parmesan but taste just as amazing! 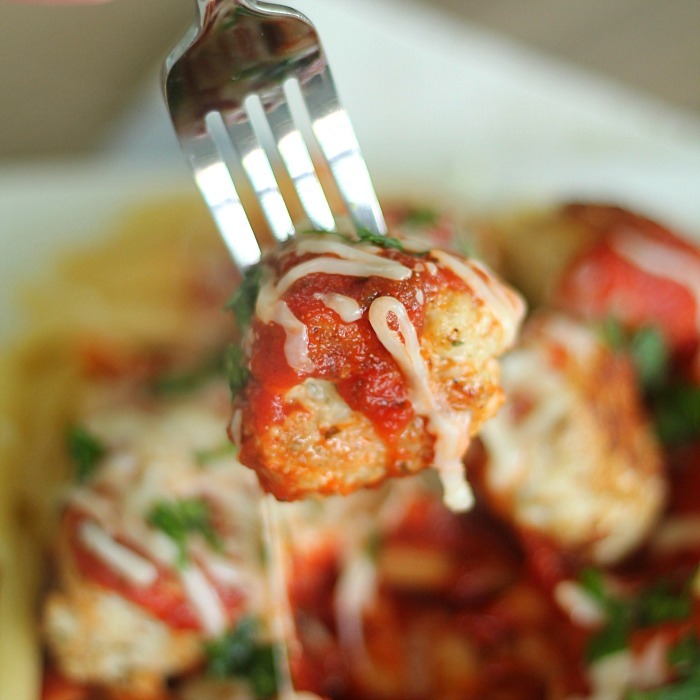 Italian chicken meatballs served over pasta and topped with marinara and mozzarella cheese. In a large mixing bowl, combine chicken, egg, breadcrumbs, parmesan cheese, salt and pepper; set aside. Roll chicken mixture into 1-inch balls and place in skillet. Brown meatballs on all sides and cook through completely. Drain excess oil and pour spaghetti sauce over the meatballs in the skillet. Cook for 3-5 minutes, or until sauce is heated through. Serve meatballs and sauce over cooked pasta and top with shredded mozzarella and fresh basil. So simple, so great ! Thank you !